It was just the perfect day at the Devon County Show. That was the unanimous verdict of organisers, trade stand holders, exhibitors and show-goers alike, after a day of unbroken sunshine, with just a breeze to take the edge off temperatures. 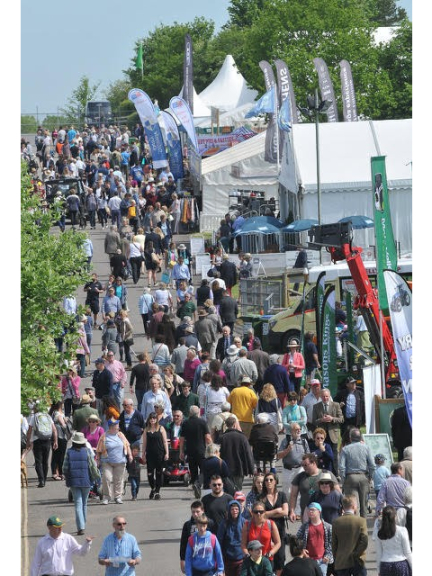 Show Secretary Ollie Allen said: “The weather could not have been better, and that, together with our usual magnificent exposition of farming, food and rural life in Devon made for the biggest first day crowd for several years. NFU President Minette Batters attended the CLA breakfast, visited the Children’s Farmwise Farm and spent the day talking to Devon farmers. The previous evening she was the guest speaker at the Devon Farm Business Awards when Jacqui Lanning, of Devonshire Poultry, was named this year’s Farmers of the Year and Ollie Allen was presented with the Life Time Achievement Award. The competition rings throughout the show ground were in full swing with livestock, equine classes, poultry and Devon honey. In the food and drink marquee the champion cheese was won by the British Organic Dairy Company of Weston super Mare and the champion cider was awarded to newcomers Pip & Stone Fruit Trees, from Honiton. Tomorrow’s highlights include the monster trucks Big Pete and the Grim Reaper and the grand parade of livestock culminating in the presentations of the prestigious Burke Trophy for the best beef and best dairy pairs of cattle. The Devon County Show continues on Friday and Saturday (May 18 and 19) at Westpoint showground, Exeter.